Aluminum Square Tube, is an extruded product that is widely used for all types of fabrication projects where lightweight and corrosion resistance is a primary concern. 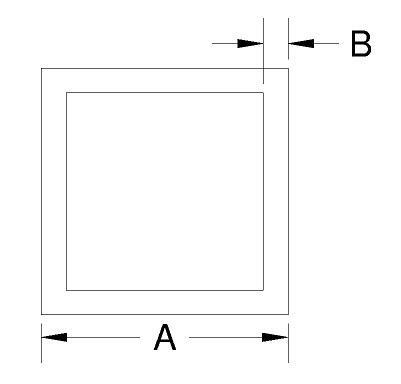 Aluminum Square Tube has square corners inside and outside, with no weld seam. Aluminum Square Tube is available in alloys 6061-T6 and 6063-T52. Aluminum 6061 is the most widely used alloy, offering better corrosion resistance and weldability than other Aluminum Square Tube. Alloy 6063 offers high corrosion resistance and strength to weight ratio. Due to its fine finish it is used extensively for architectural trim, door and window frames, awaning and canvas construction, furniture components and trim, safety and deck structures, athletic equipment, frames, racks, trailer trim and beds, conveyors, machine parts, guides, supports, ornamental usage and a wide variety of applications in industrial, construction, automotive, marine, appliance, and agriculture industries.